A 61-year-old prosecutor with the state attorney general's office was killed when scaffolding fell on him after lightning struck a church steeple in Brooklyn Thursday evening, police said. 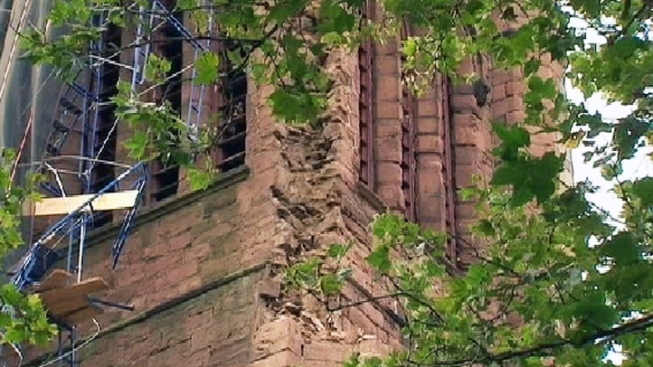 Police said lightning brought down bricks onto some scaffolding at the historic Christ Church in Cobble Hill during the intense round of storms that battered the tri-state area. Part of it collapsed on Richard Schwartz as he was walking home. Schwartz, a prosecutor with the state Attorney General's office, was pronounced dead at Long Island College Hospital. Neighbor Nicola Wheir saw the lightning explosion and watched the massive boulders coming down from the church on to the streets below. When she saw Schwartz hit underneath, she ran to call 911 and her husband rushed out to his side. Incredible video of lightning crackling across the sky in Middle Island, N.Y. during the summer storm on Thursday, July 26. "He was moving, he was like, ' I think I'm OK, I think I'm OK," said Wheir. When Wheir learned of Schwartz's death Friday morning, she was devastated. "We really thought he was OK," she said. Fire officials say the destructive bolt struck the 171-year-old church shortly after 8 p.m. The church had been wrapped in scaffolding as part of a year-long construction project to repair damage caused by years of weathering. Schwartz lived in a brownstone two blocks from the church, where neighbors said he spent much of his time. "From what I hear, he was a hard-working man, and he worked late," said neighbor Fred Trulli. Utility crews in New Jersey are busy as they restore power after Thursday's intense storms. Brian Thompson has more. Gov. Andrew Cuomo, who worked with Schwartz when Cuomo was attorney general, said in a statement Schwartz was a "dedicated public servant and attorney who served the State of New York in the Office of Attorney General for over 25 years." "His commitment to placing the needs of New Yorkers above all else will be remembered and cherished," Cuomo said. The church's pastor said he was devastated by the death. 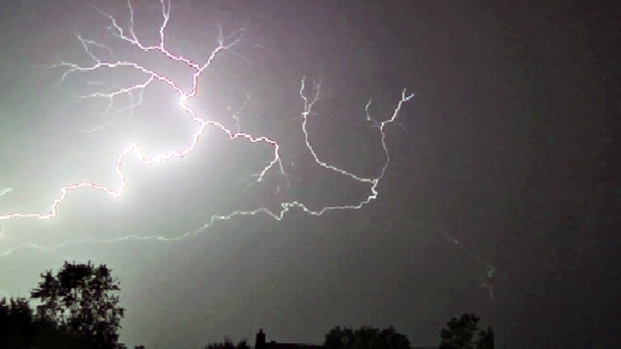 A cluster of super cells slammed neighborhoods north of the city. Marc Santia has more from Bloomingburg, New York. "I'm speechless, I'm devastated, I'm very sad," said Rev. Ron Lau of Christ Church. "On the other hand, I profess a religion that is full of hope and resurrection." The boulders dislodged by the lightning explosion also crushed cars and smashed windows. Meteorologists say Thursday's storm system was a derecho, a line of intense thunderstorms that produces a large amount of wind damage over a long distance.